The Miocene Waipiata Volcanic Field (WVF), New Zealand, is an eroded phreatomagmatic volcanic field. Three different types of vent or vent complex were recognized. Vent-filling deposits comprising predominantly lava, preserved in the form of plugs, necks, lava lake remnants, lava flows, or dykes, were classified as Type 1 vents. Type 1 vents are inferred to be the remnants of scoria cones, most of them with thin basal phreatomagmatic pyroclastic deposits. Vents represented by predominantly pyroclastic infill are classified as Type 2 vents. Type 2 vents are inferred to have been the substructures of phreatomagmatic tuff ring/maar volcanoes, many of which may have had associated scoria cones. Type 3 vent complexes are groups of closely spaced or overlapping vents, with voluminous preserved lava flows. Type 3 vent complexes are the remnants nested maars and tuff rings with associated magmatic explosive and effusive products. Pyroclastic rocks of most of the Waipiata vents record initial phreatomagmatic explosive activity fuelled by groundwater followed by Strombolian-style eruptions. Erosion rates for the WVF are 5 to 50 m per million years. Cenozoic sedimentary cover was widespread and still complete ( e.g. 200 – 400 m thick Oligocene marine units) at the time of volcanism, although over much of the field no Cenozoic sedimentary rock units remain today . Vent alignments largely follow the basement structural pattern of the Otago Schist, defining NESW and NW-SE trends. The longest vent alignment, traceable in ~ 30 km, coincides with and is parallel to the largest fault zone in the Otago region, the NW-SE trending Waihemo- fault zone. The total volume of magma erupted in the WVF is estimated to have been ~ 9 to 40 km^3 DRE. A systematic compositional sequence exists at each volcano, with initial phreatomagmatic eruptive products being differentiated tephrite and phonotephrite composition, whereas subsequent lava flows and dykes are of primarily basanite. Basanite was parental to the tephrite and phonotephrite. Basanite generated beneath WVF appears to have “failed” to reach the surface, instead being captured en route and stored to produce tephrite phonotephrite via 15-25 % crystal fractionation of olivine and clinopyroxene. Many attempted eruptions of parental basanite "failed", and that each successful eruption at the surface involved both a newly-injected basanite from depth, and a transected and entrained remnant of melt evolved from magma captured at shallower depths from a preceding "failed" eruption. Significant amount of magma was underplated beneath or injected into the crust of the WVF. The Otago crust is density and rheologically stratified, and in the Miocene lay within a mild extensional (strike- slip) tectonic regime; this combination was responsible for the entrapment of magma at various levels in the Waipiata – Dunedin region. The WVF-wide trend in magma evolution at individual vents has also been demonstrated from the mild extension-related Late Miocene Bakony- Balaton Highland Volcanic Field (BBHVF), Hungary. Recognition of this pattern at two unrelated fields may suggest that initial injection, with subsequent entrainment to produce dual-source monogenetic eruptions may be common in intracontinental alkaline basaltic volcanic fields. It is suggested that the lithospheric density and rheological structure, together with the state of stress, play an important role in fostering magma injection and entrapment in areas where the crust is 1) strongly density stratified, 2) relatively thin, 3) hot (high heat flow), and 4) the crustal stress regime mildly extensional, preferably with strike slip movements. These conditions were shared by the WVF and the BBHVF, with the result that magmas, processes of storage and differentiation, and ultimate eruption and volcano formation were in many ways remarkably similar. 2 v. : ill. (some col.), maps (1 folded, col.) ; 30 cm. + 1 computer disk. 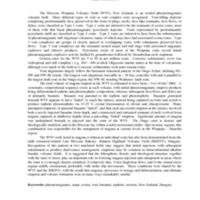 Németh, Károly, 1969-, “Phreatomagmatic volcanism at the Waipiata volcanic field, Otago, New Zealand ,” Otago Geology Theses, accessed April 22, 2019, http://theses.otagogeology.org.nz/items/show/384.